Teachers have to have confidence – to a certain extent; we stand in front of a critical audience every day for a living. No matter what the age group, it takes confidence to deliver decent quality lessons that have thoughtful planning that deliver successful outcomes for learners. Although, how many teachers have confidence to stand in front of their peers and talk about the work they do, which is often both amazing and inspiring? Many, many less. The list of ‘enthusiastic lurkers’ at TeachMeets is often much, much longer than the list of those willing to present their ideas. Reading back over my ‘Nurture’ blog post, inspired by @chocotzar; I wrote in January that I was going to try and be brave enough to ‘go to a TeachMeet.’ GO! Just turn up. Not present. Since then I have presented at five and I have organised TMSoton, which is taking place this coming Friday. I wonder what has happened to my confidence between January and now for that change to occur? My self-confidence outside my own classroom has certainly improved – but I wonder if there is anything in my experience that I can share to encourage other teachers, who have not yet presented to come and share their ideas. I have always been a confident teacher in my own classroom. I’ve always had a handle on behaviour, assessment, and planning. For as long as I can remember I have enjoyed my job, and relished trying new lesson ideas in the classroom. In January, the idea of even going to a TeachMeet was petrifying. I was worried no one would talk to me, that the ideas presented would be beyond me, that I would stick out as not good/interesting enough. After some serious encouragement I went to TMBett in February and had a total and utter blast! I was delighted to meet so many people I had been talking to for a while, and found many of the presentations really useful. I went back to work – I tried them out – and hey presto, my teaching practice evolved and improved. Being in an environment with like-minded individuals is inspiring. I guess that could sound silly, or a bit naff, but I couldn’t wait to try out some of the ideas – they were not beyond me – I learnt to have confidence in my own abilities as a learner. I think that blogging has improved my confidence, but actually what really forced me to present for the first time was the desire to be part of this amazing community sharing ideas. I knew I had things I wanted to talk about, I just needed to overcome my self-doubts. I had to make myself. I was also motivated by many friends, gently (vigorously at times) nudging me to do so. Also, in no small way I wanted to address a rather male celebrity – teacher culture, which meant that to a certain extent, TeachMeets had turned into a traveling circus of the same folk agreeing with each other. That probably sounds more contentious than I mean it too – but I think it’s fair to say that some TeachMeets had become a bit self-congratulatory, and were not seeking out ideas from new people, but encouraging already well known bloggers to achieve a platform for their admirable work. It can be a daunting platform to approach, (a bit like platform 9 and 3/4 – sometimes you just have to run head on into it!) however I would say that my experiences have been positive. Other teachers have used my ideas, and made them better, so that next time I try them, my own practice will have been improved from sharing. It has encouraged me to be innovative in my approach to my profession, and know that I have a soundboard for ideas that often leads to further creativity and refinement of ideas. So then, back to confidence. How to enable other teachers, new voices, to speak at TeachMeets? I wonder, in thinking about this, where the issues lie. People who are happy to stand in front of a class find presenting to their peers a really terrifying concept. I hear a lot of teachers say ‘my ideas aren’t interesting/innovative/exciting/new/original ‘ enough. Well, do you know what? This just isn’t true. I have been to plenty of TeachMeets where the ideas were none of the above, but those presenting were talking about really amazing practice or ideas that WORK. We can all learn from ideas that actually work and benefit our learners. Just because you don’t see your ideas as original/interesting doesn’t mean that someone else will not. I was actually almost speechless the first time this year that someone called my teaching practice ‘creative’ – it is what I have always done. I don’t know any different. To be honest, I have moments of self-doubt where I wonder if what I am doing is good enough – but I get a lot of validation from my students, and results. The endorsement of my peers, whose knowledge and experience in many cases massively outweighs my own, has been a massive confidence boost. Trust me- if you care about your learners and strive to do the best by them, you will have something to share with the wider teaching community. Another barrier to presenting is if teachers are naturally introverted. Not everyone is happy dealing with potentially large audiences. Nerves kick in, which can be crippling. This I can sympathise with. I shook like a leaf for an hour before TMClevedon – and I don’t normally feel that nervous about speaking in front of people. It is a fear of being judged – a fear that you are not good enough, that can come from all sorts of roots. I wonder how many teachers fight to empower learners in their classrooms, yet, are afraid of the judgement of their peers? Maybe this is rooted in negative experiences of childhood, the fear of raising your hand in case you make a mistake. The great thing about presenting is it doesn’t have to be perfect. Your presentation isn’t a masterpiece, but a work in progress, and actually a pretty good time to cast off some of the demons of past experience. Nerves are good – it means you care about the outcomes, and in taking a risk in presenting, you are actually being a positive role model for your own learners – you are demonstrating how you would like them to be. You are taking risks! You are seeking peer assessment, you are showing intrinsic motivation. As a teacher it is a powerful message to your students that you are also a learner – and willing to share with a wider community in the way that so many teachers expect students to be comfortable with. So, imagine you decide to present and your ideas fall flat. What would you do? What’s the worst thing that could happen? I will tell you. You would pick yourself up again, go back to work and reflect. You would personify the most important thing that our learners can be, you would be modelling resilience. I actually can’t think of any presentation at a TeachMeet that fell totally flat – the diversity of the audience ensures that all ideas receive a positive reception from someone. However, there is so much power in accepting that you may need to be resilient, and putting yourself in the place of your own learners. The most powerful teachers are those that model positive learner characteristics, and how powerful is it to be able to demonstrate that it is not only ok to try and fail, but actually can contribute to the learning process? Was it Ghandi that said ‘be the change you want to see in the world’, well I say don’t just be, live it and preach it to the kids. Show them that even teachers have to fight to get better, taking on board feedback and improving. Part of judgment is feeling that you, as a professional, might be compared with others who you feel are better/more interesting or even will rebound better than you. Well, you know what, I have met a lot of twitter famous teachers and they have the same insecurities that you do. Many speak and present for the same reasons as everyone else, to improve their practice and to contribute to a wider teaching community. Yes – I know, they have a gazillion followers, but many, many of them are just lovely and more than willing to help, talk to you and encourage your practice to grow. Don’t be intimidated by these types, they are just the same as you and really, no one is drawing comparisons between you and them. Get up there and talk about your ideas, your practice, how you have made things better, because you are a force for change in the world – and that is something to be proud of. For some the IT is an issue, as can be the live streaming of events. Know what? I’ve spoken at events where my IT was perfect, and *whispers.. No one noticed. They were too busy talking about my daft parachute. Once you are up there you don’t even notice the camera – and it actually feels like leading a really big lesson. You need to trust in yourself, that your teaching mojo, in whatever form it takes, will give you an autopilot and you will get through it just fine. As I said earlier, if you make a mistake, it really doesn’t matter, the community is nurturing, they won’t focus on the bad but the good in your ideas. I promise. 1- if you have the outcomes of the students at the heart of your practice, then you have an idea that would be valuable to share with others. 2- don’t be afraid of making mistakes. Mistakes are how everyone learns- not just those with impending exams. 3- don’t worry about being judged. The TM community is nurturing and anyone that might judge you isn’t worth your worry. 4- don’t compare yourself with anyone else. You would be mortified if a child in your class did this, so why do it to yourself? 5- Recognise that transformative potential that presenting might have in your own practice. These tips are my pep talk that I run through every time I sign up to present. The impact of doing so has been invaluable for my own practice and I would love to see new people and hear new voices at each TeachMeet I go to. This one is a Dr Pepper moment – what’s the worst that can happen? Thanks to @sidchip64, @gwenelope, @nicboardman and @gruntledlass for input about having the fear, and I hope to see them all present very soon. Anymore ideas? Why might teachers be afraid of sharing ideas with other teachers? Please let me know. 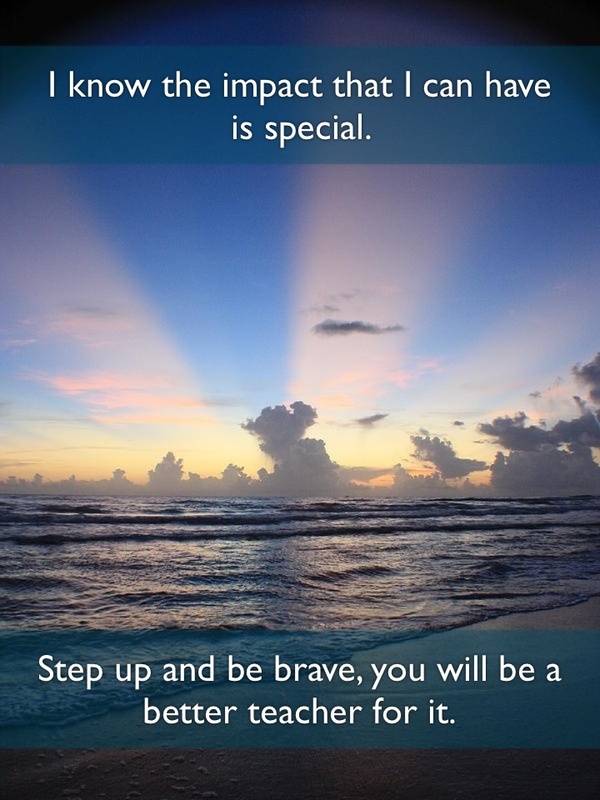 I don’t think that I’m anything special, but I know the impact that I can have is special – step up and be brave, you will be a better teacher for it.